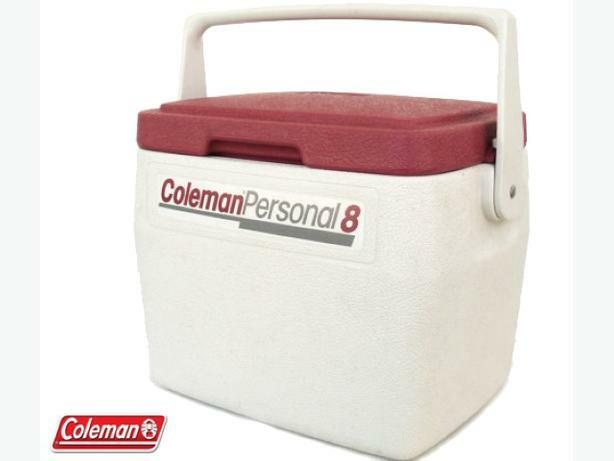 Coleman "Personal 8" Cooler for Sale. Model 5272 from the late 1980's. I guess Coleman no longer makes these anymore, and it's a shame as they are perfect as a lunchbox for people at work or out & about. Insulated lid and body which keeps your lunch cold (or warm) for hours. The exterior dimensions are 11" x 9" x 10" tall. The carrying handle locks the lid into place. There are handy cup/pop-can holders on bottom side of lid. Made in Wichita Kansas USA. Used, but in good condition.